Don't be caught unprepared in an emergency. 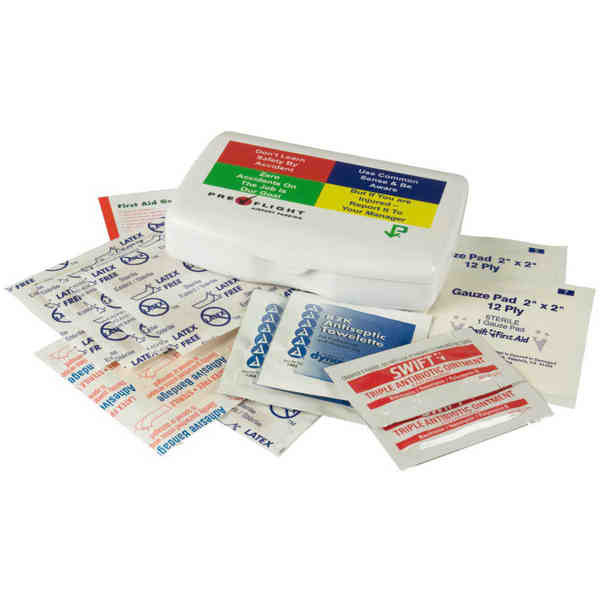 This digital express family kit is a durable living hinge box that contains eight latex-free adhesive bandages, five latex-free junior bandages, two antiseptic towelettes, two gauze pads, one extra-large latex-free bandage, two triple antibiotic ointment packets, and a first aid card. Measures 3 1/8" x 4 1/4" x 7/8" with a 1 7/8" x 3 1/2" imprint area. This first aid kit is union made in the USA. Size: 3 1/8 " x 4 1/4 "
Price Includes:full color digital imprint on base.